UCLA researchers are using a radioactive tracer, which binds to abnormal proteins in the brain, to see if it is possible to diagnose chronic traumatic encephalopathy in living patients. Warmer colors in these PET scans indicate higher concentrations of the tracer. Chronic traumatic encephalopathy is found among people who've had head injuries. Though not everyone with head trauma develops CTE, the group that's come to be most associated with it is football players, whose brains can be routinely jarred by hard hits. The disease has been linked to depression, dementia and even suicide among those who play the game. But the Journal of Alzheimer's Disease published a study Tuesday that helps broaden the understanding of who is potentially affected by CTE to include military personnel. And, perhaps more significantly, the study represents a step forward in developing a test for the disease in the living. Right now, accurately diagnosing CTE requires the close study of brain tissue during autopsy, to identify the telltale abnormal proteins that kill brain cells. And this is a key reason why knowledge about CTE — who gets it, how widespread it is and the development of treatments — has lagged. "You've really got to have a living diagnosis scan in order to make much headway on understanding the disease," says Dr. Julian Bailes, a neurosurgeon at the Chicago area's NorthShore University HealthSystem, and one of the study's authors. That diagnostic scan is what researchers have gotten close to in this case. The small study involved seven military personnel — five veterans and two active duty — who'd had brain injuries and experienced CTE-type symptoms, such as memory loss and mood swings. They were injected with what's called a molecular tracer — in this case the shorthand name is FDDNP. The FDDNP tracer, which is radioactive, binds with the abnormal proteins in the brain and then appears in neural PET scans. 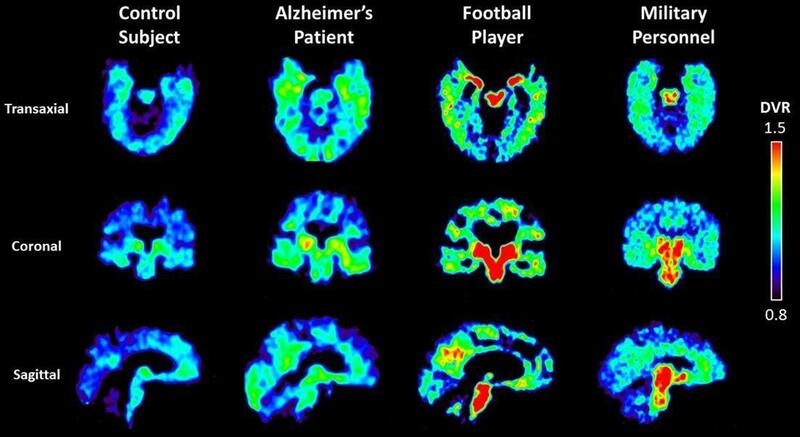 Small's team compared the scans with those of a number of other people: Fifteen retired football players who had suffered brain injuries and exhibited CTE symptoms; two dozen people who had Alzheimer's dementia and 28 healthy "control" subjects who were cognitively intact. The results: The scans of the military personel showed patterns similar to the retired football players and different from the Alzheimer's patients and control subjects. And, it should be noted, the former players — all of them professionals who'd played in the NFL — had brain scans consistent with those of people who had died and had autopsies that confirmed CTE. Small says the study paves the way for deeper investigation of CTE's brain changes. "It could help us not just with people who've had head trauma from sports," he says, "but also from other forms of injury, such as blast injury in the military." Survivors of domestic violence are another group believed to be vulnerable to CTE. Small is quick to caution that the study isn't definitive. "There are several limitations," he says. "One is [the small] sample size. Another is that we don't have a control group of individuals who've been subjected to the same degree of head trauma, but are asymptomatic. ... And what does that tell us? There may be something else we're completely unaware of that's driving the disease." A reliable test for CTE in living people is still at least a few years away, he estimates. But there already are plans for more research. "We're still within the scientific process of trying to figure out where this test lands on the scale of being definitive," Bailes says. The researchers still need to determine "how it correlates with the changes actually seen in the brain when people die," he explains. "It's not definitive yet but this paper in a military setting is another piece of the puzzle, we think." A potentially pivotal piece of the puzzle. "If you can't diagnose a disease when someone's alive," says Bailes, "you really can't help them. And you really don't know, in a new and emerging and not completely understood situation like CTE. You don't know the prevalence of it. You don't know exactly who gets it and why. You don't know how it evolves or changes over time and if there's ever a potential for treatment." As another football season approaches, CTE will again be a lingering issue. And in some instances, it will be portrayed by some as it has in the past few years — as an "epidemic," threatening the game's future. Which Bailes says is wrong. "I don't think it's an epidemic," he says, "but whatever the number is, is important. And you have to have living diagnosis in order to be able to tell that."